“Nats Fans Are People Too” is a new series taking you inside the minds and lives of the District’s biggest Nationals fans. Do you know somebody who should be featured? 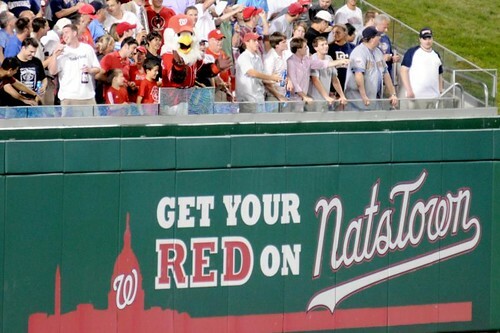 Are you one of the many die-hard Nats fans in town? Get in touch by sending a message to rachel@welovedc.com! Some District residents might recognize Mark Strattner on the Metro or in the stands on game day. He was named the Nationals’ 10 millionth fan at a Nationals-Red Sox game in 2009 at Nationals Park. By day, Strattner is the the Chief of Collection Services Division at the Law Library of Congress. After hours, it’s all about the Washington Nationals. Mark Strattner has been a Nationals season ticket holder since 2005 and a National League baseball fan his entire life. He grew up the son of baseball fans from Dayton, Ohio, whose parents were from Cincinnati. The family’s blood runs deep with a love for the Reds, but mostly for the National League. This was a consequence of where he was raised. Young Mark was born not too far from the District in Norfolk, Va., home to a Mets triple-A team, but Mark says that didn’t count. It’s Strattner’s belief that the American League doesn’t really play baseball because of the designated hitter. Therefore, he could never shift his baseball allegiances to a team like the Orioles. It’s not their location that bothers him, it’s the league in which they play. Strattner was hopeful a National League team would find its way to the District, but it wasn’t until the rumors started floating in 2004 that his dream started to seem possible. After the official re-naming of the team at Union Station when the Montreal Expos became the Washington Nationals in November 2004, Strattner bought his season tickets. It was official. His National League team had landed. He would become a Nationals fan. “You don’t realize how long 161 or 162 games are until you try and go to 81,” the six-year season ticket holder said. “Baseball is a long season and they play every day. I never realized how draining it was.” Strattner has attended close to 80 Nationals games in the past five years and is on pace to do so again in 2010. He doesn’t just attend home games. Strattner and his family or co-workers have made a trip every year since the Nats inaugural season to at least one game in another team’s city. Strattner was one of about 500 “foolish National fans” braving the onslaught of the Phillies for Opening Day 2005 at Citizens Bank Park for the Nationals franchise opener, he said. Then in 2006, it was off to Fenway for a trip that almost didn’t happen. Strattner did make it to Boston. He hobbled all the way to Fenway from his hotel. That’s the kind of Nats fan Mark is. He wouldn’t miss a game for anything. Not when his team is playing. Not a chance. The Strattner out-of-town baseball tour continued in 2007 at the Minnesota Twins Hubert H. Humphrey Metrodome and Chicago’s Friendly Confines at Wrigley Field. Then, in 2008 at Great American Ballpark to watch his beloved Nats take on his family’s favorite team the Reds. Strattner’s also attended Nats games in Milwaukee, Pittsburgh, and Baltimore. He even took a week and a half off work to go down to Spring Training for the first time in his life in 2010. “I must admit that everywhere we’ve gone, most people have been tolerant of us,” he said of being a Nats fan at other team’s parks. It’s not just the allure of a new park, traveling to different cities, or the excitement of a new team that keeps this baseball fan going. It’s the love of the game in its entirety. Strattner went on for nearly two hours about anything ranging from why he thinks Adam Dunn really is turning into a fine first baseman, to how Stephen Strasburg’s Major League debut is a catalyst toward turning D.C. into a baseball town. He loves what the Lerner’s do to support the troops in between innings and how our service men and women are treated while at the ballpark, but he also thinks the President’s Race is “the most pathetic thing ever” and a distraction from the game being played. There is not one nook or cranny within the entire scope of Nationals baseball that Mark Strattner doesn’t have an opinion on. He loves this team and loves to offer his constructive criticism and praise when asked. Strattner does have a pet peeve though. He can’t stand all the talk about the Washington Senators. That hasn’t discouraged him one bit though. 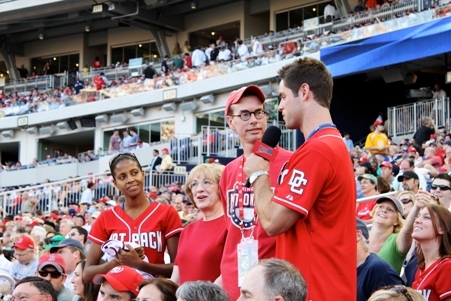 Strattner continues to show is support for the Washington Nationals by attending games, following the team around the country at least once a summer, and talking Nats baseball with just about anyone who is willing to listen. Besides that, Strattner has but one request to his fellow residents in NatsTown — quit being so nice all the time. A little more fan involvement can’t hurt much. Strattner was at the first franchise game where Philly fans were booing their players while they were beating the Nats five to nothing in the seventh. He’s seen the “mean-ness” in action, and although he joked that maybe Nats fans need to start booing their players to entice them to win a few more, he really just looks at fan involvement all in good fun. Great guy, great fan. Was my pleasure being a part of this moment. For the record, that walking microphone stand is not a person. He’s a caricature. It would be great if you guys could feature blogger Nats320. Jeff goes to most all of the games, and gives great write ups and photos. He’s been there from day one and covers a lot of other aspects of the team. Jeff, a super nice guy by the way, is no fair weather fan, he wears his heart on his sleeve and has never let the Nats poor play get in the way of his love for the team. If there’s ever a Nationals Fans Hall of Fame, Jeff will be in it!! The Montreal Expos are not the heritage of baseball in Washington. The Washington Senators (both incarnations) are our heritage. The Senators played here, the Expos never did. You don’t tell an area to abandon its heritage just because a new import comes to town. I gather that Strattner himself is an import to this town. Does it bother him that I, a native, don’t want to adopt his heritage as my own just because he happened to settle in my town? Also, all this talk about the Expos seems to be coming from people aren’t from here. I hate to get all LOCALZ OWNLEE on folks, but there is no way I will retroactively adopt the heritage of a team from another city. I think most Washingtonians feel that way too.